Another 3rd cousin just wrote yesterday. I knew he was going to write me because his brother Carl told me his older brother had a lot of info on his Archambeault ancestors. I am Carl Archambeault’s older brother, Frank. 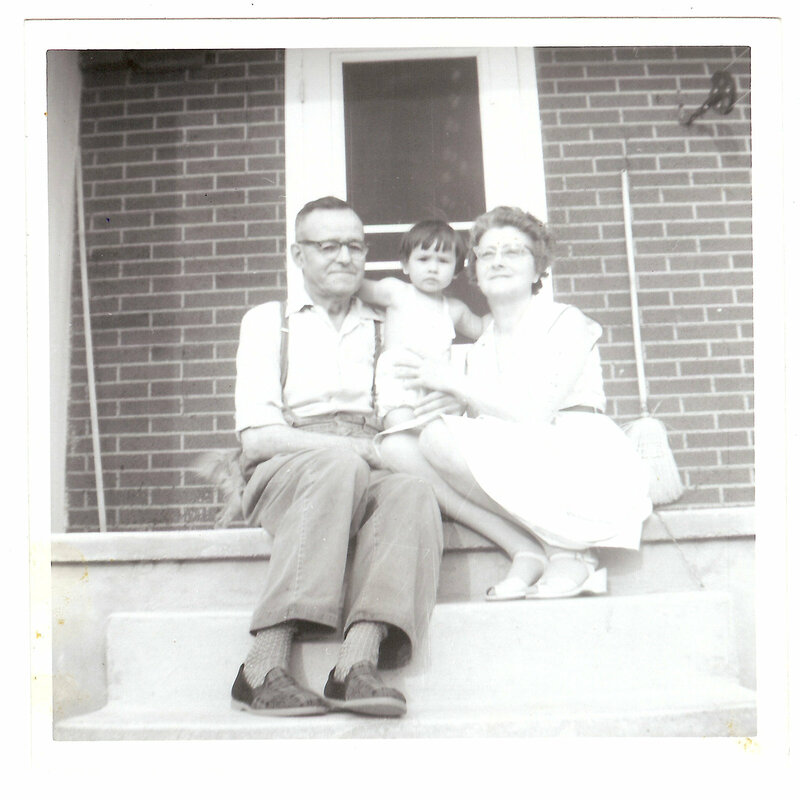 First, I want to tell you that I greatly appreciate the provided links to photos of my ancestors — you have no idea how much viewing previously unseen photos (e.g., William and Myra with baby Raymond) of my grandparents means to me. What I am looking for, with cautious optimism, are old photographs (really, tin-types) of William’s father (Jean-Baptiste Archambeault) — and, pushing my luck here, Jean-Baptiste’s father, Joseph Archamb(e)ault as old man. I must say that I DO NOT expect you to put much, if any, time into looking for this information. Yet, if it is available to some of your contacts, I would be thrilled. I replied back, a few times, then I invited him on my family tree where all my information and pictures are stored. I got this confirmation this morning. Good news – Frank Archambeault has accepted your invitation to join your family tree. 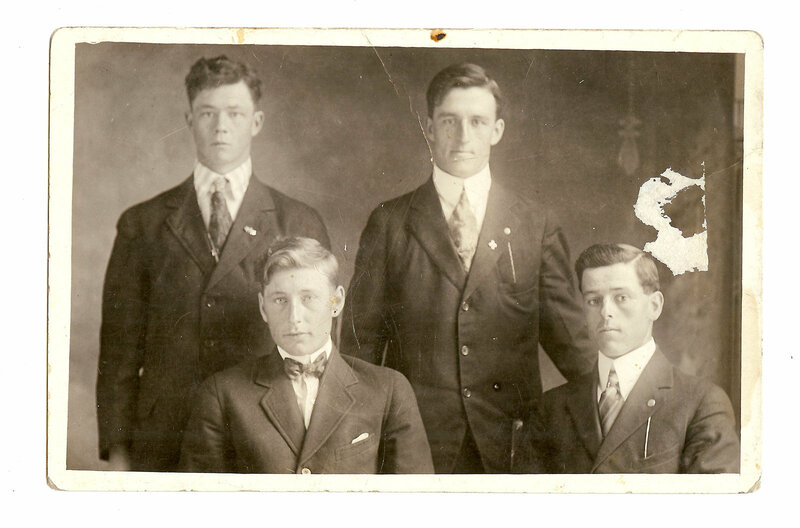 Frank is a direct descendant of this man… who is also my 8th grandfather. Of course I knew that Frank and I were related, but what I was missing… was the missing link. 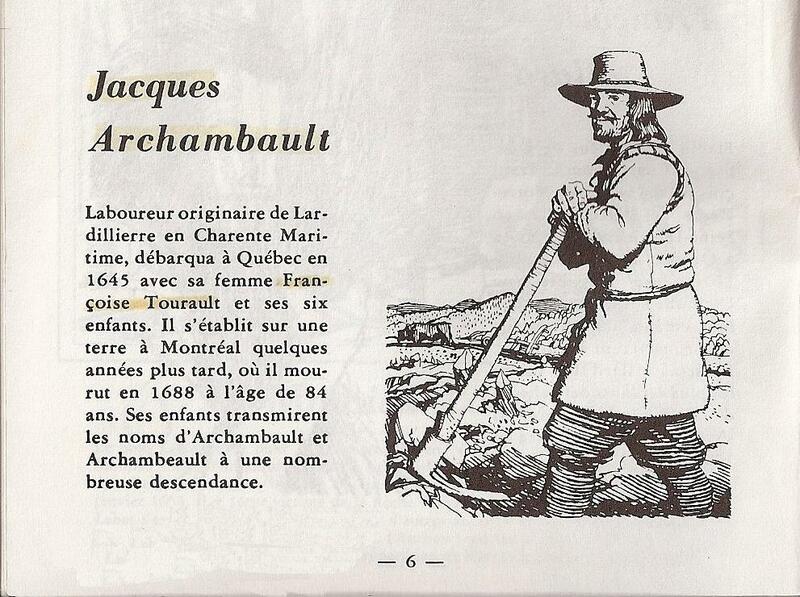 Who were the parents of Jean-Baptiste Archambeault? 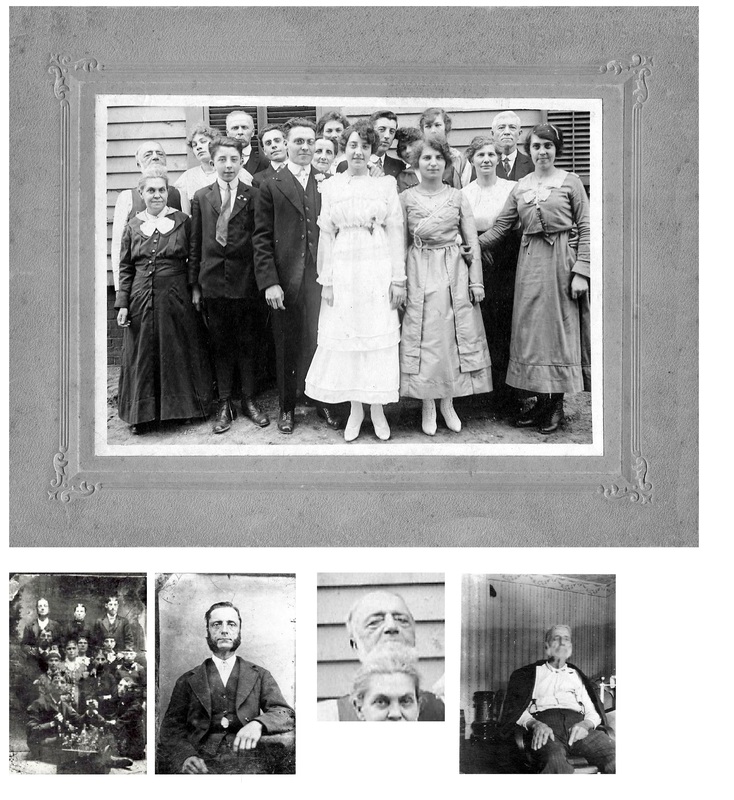 I want to tell you that I greatly appreciate the provided links to photos of my ancestors — you have no idea how much viewing previously unseen photos of my grandparents means to me. Frank, how about what I had in store while I was waiting for you to get in touch? Jean-Baptiste Couture who emigrated to the United States like 900,000 other French-Canadians now has several new descendants who knew nothing about their roots. This is the case of all the descendants of Albert D. Seymour who was a son of Jean-Baptiste Couture. Albert was little Sophie’s brother. Albert D. Seymour was born around 1855 and he died on February 22, 1920 in Grand Ledge, in Eaton County, Michigan. He was married to Laura Cramer on July 3, 1883 in Mt Pleasant, in Isabella County, Michigan. After Albert died, Laura remarried on July 11, 1920 with George P. Bartlett. 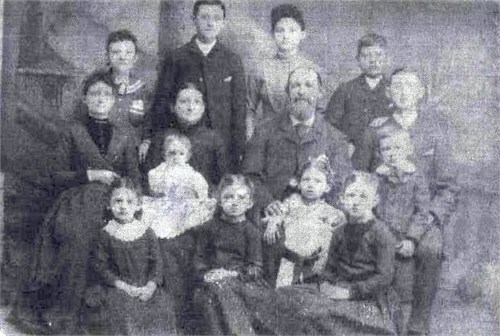 Albert D. Seymour and Laura Cramer had at least eight children. This is the source… the 1900 U.S. Census. Lloyd M. Seymour is our link to the person and her daughter who both wrote me about their Seymour lineage. Now the people who contacted me only have to spread the good news around. I have got to keep this simple. Someone wrote me a message a month ago about her Seymour lineage. I was wondering if your family tree is possibly related to me so I can research my ancestors. My Grandpa was Lloyd Marshal Seymour and he had a daughter Viva Mary Seymour. Unfortunately this is all the information I have besides they lived in Michigan. Are they connected to your family tree? Strangely enough I had these people in my family tree. Strangely enough I was related to them although quite distantly. That person’s daughter asked me how we were related. Little Sophie Couture is the one who reunited us and is responsible for all this. She’s a 3rd cousin 4 times removed. Sophie Couture, my 3rd cousin 4 times removed, was baptized on February 13, 1850. She was 4 weeks-old. This is what is written on the baptisimal act. That would put her birthdate around January 16, 1850 in St-Ignace, Vaudreuil County in Quebec. Sophie was the daughter of Jean-Baptiste Couture and Sophie Gauthier. Jean-Baptiste Couture became John Seymour when he emigrated to the United States. I don’t have much information on little Sophie Couture. She probably died young like so many children back in the 1800s. We find Jean-Baptiste Couture in the 1880 U.S. Census. He is living in Michigan with his wife Sophia and his son Adolphes. John Seymour is said to be 66 years old. He would have been 30 when he got married in 1845 with Sophie Gauthier. Sophia is said to be 65. She would have been married when she was 29. That seems to be a little bit odd. Usually people back then would get married around 20 and have children every year or so. But this same information is found again in the 1894 Michigan Census. John Seymour is listed as being 80 so is Sophia. So we have two sources with the same information. It’s funny when you start searching for ancestors even if there are not your own. 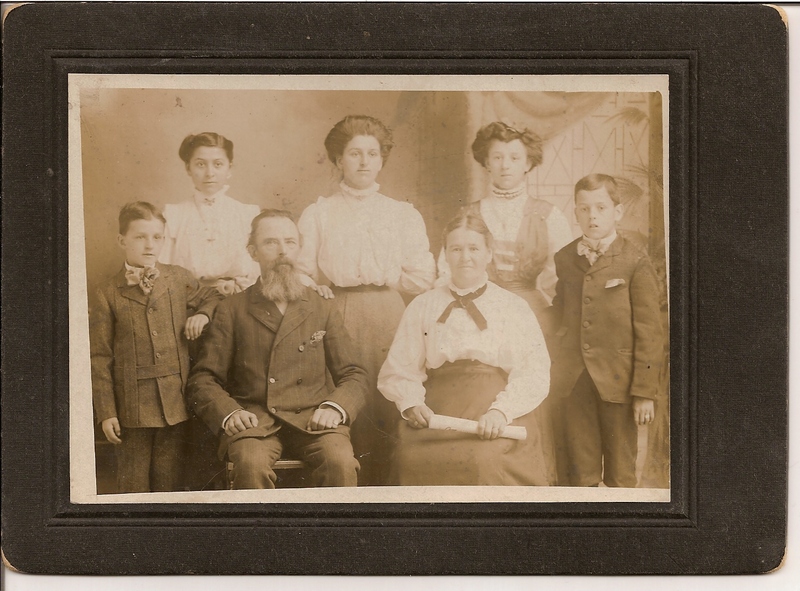 This why I call it addiction, like this blog about genealogy. Now if we only could find old pictures of this family. About pictures… We have one of Sophie Couture’s cousin. His name is Joseph Girard (Gerard). He is Sophie Gauthier’s nephew. Joseph Girard is seen here with his wife Léocadie Neveu and some of his children. The old man with the beard is Maxime Neveu with his wife Scholastique Lauzon beside him. Joseph Girard is on the far right while Léocadie Neveu is on the far left. All these people lived in West Bay City, in Bay County, Michigan. The little girl in the middle in the front row is Jenny Girard. This is what I found on her. This is the translation of the article I wrote on my blog Nos Ancêtres in February 2011. Someone had written me about Sophie Gauthier and Jean-Baptiste Couture. Michel Lauzon is related to Rose Gauthier, Sophie’s sister. 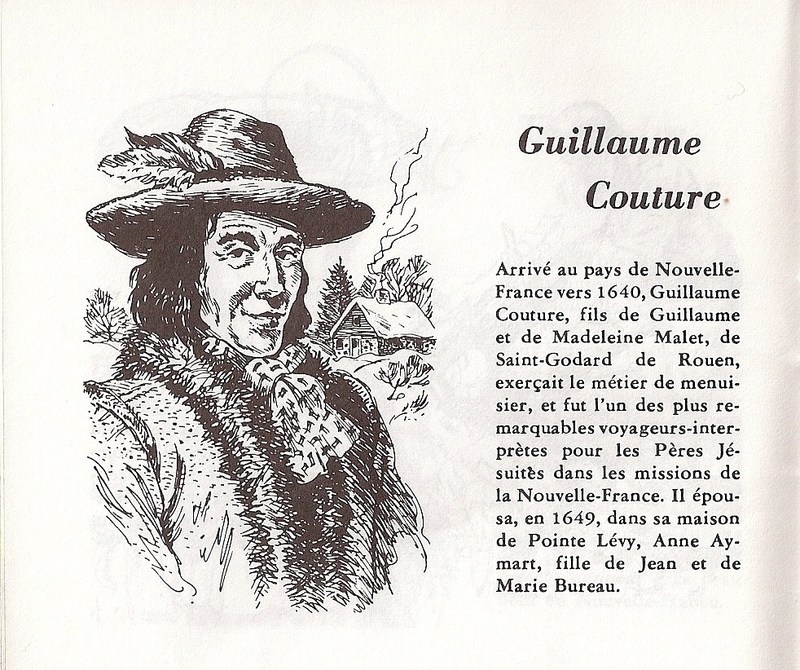 As I discovered, some descendants whose name were Seymour were in fact descendants of Guillaume Couture. I have found out since 2007 that when you start digging for your roots you come across other people’s ancestors. This blog has now more that 280 articles, 288 articles to be exact. Guillaume Couture was John Seymour’s ancestor. John Seymour’s name was in fact Jean-Baptiste Couture. In 1845 he married Sophie Gauthier whose sister was Rose Gauthier, aka Larosae Gotié. When Sophie Couture was baptized (the daughter of Jean-Baptiste Couture and Sophie Gauthier) on February 13, 1850, in Coteau-du-Lac (St-Ignace ), the child is 4 weeks-old. It is written that the father is a laborer at Trout River. This would be in New-Brunswick…, but is there another place with the same name? Often when someone is found somewhere, other members of the family are close by.…. 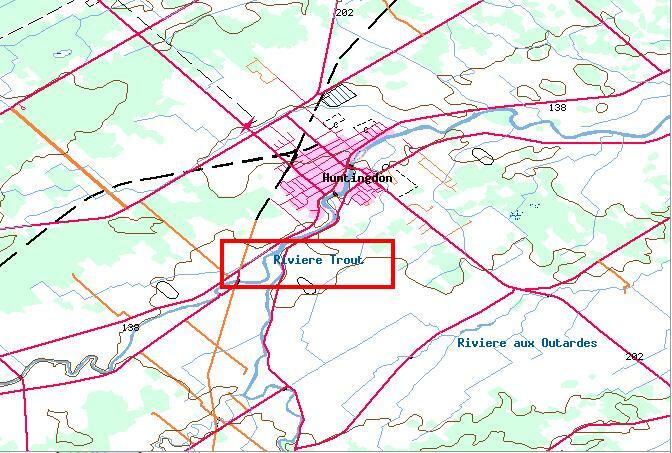 There is a Trout River near Huntingdon, the town of mayor Stéphane Gendron. This has to be the place where Jean-Baptiste Couture was working in 1850 when little Sophie was born. 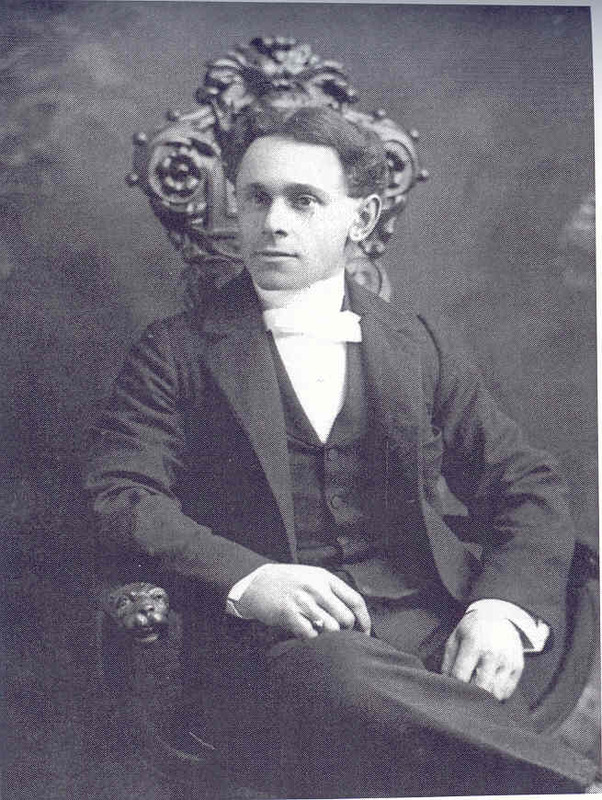 Jean-Baptiste Couture emigrated to the United States like 900,000 other French-Canadians. 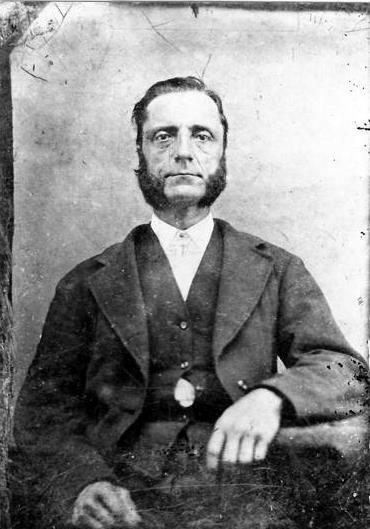 Several descendants of Guillaume Couture are found in Michigan and probably most of them ignore their French-Canadian roots. This is the case of the descendants of Albert D. Seymour, a son of Jean-Baptiste Couture. Albert D. Seymour was born around 1855 and he died on February 22, 1920 in Grand Ledge, in Eaton County, Michigan. He was married to Laura Cramer on July 3, 1883 in Mt Pleasant, in Isabella County, Michigan. 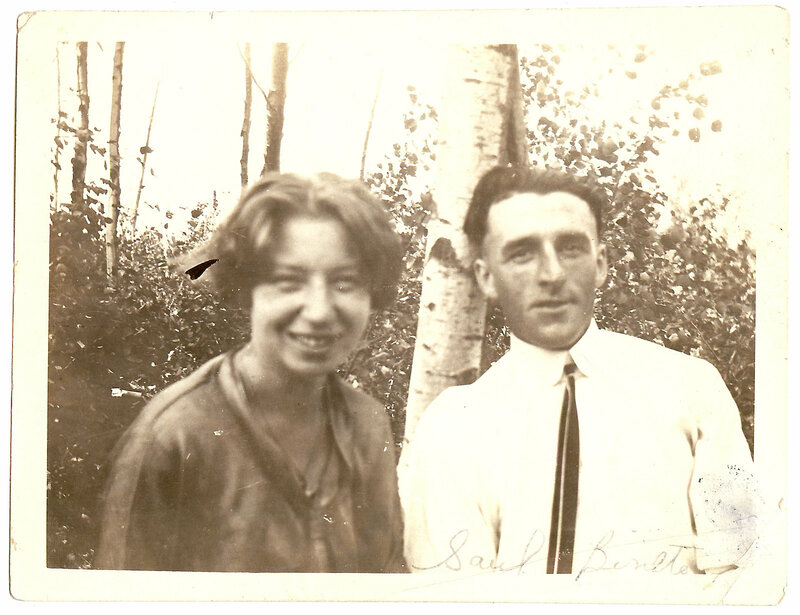 Laura remarried on July 11, 1920 with George P. Bartlett. The Couture-Cramer couple had at least eight children. 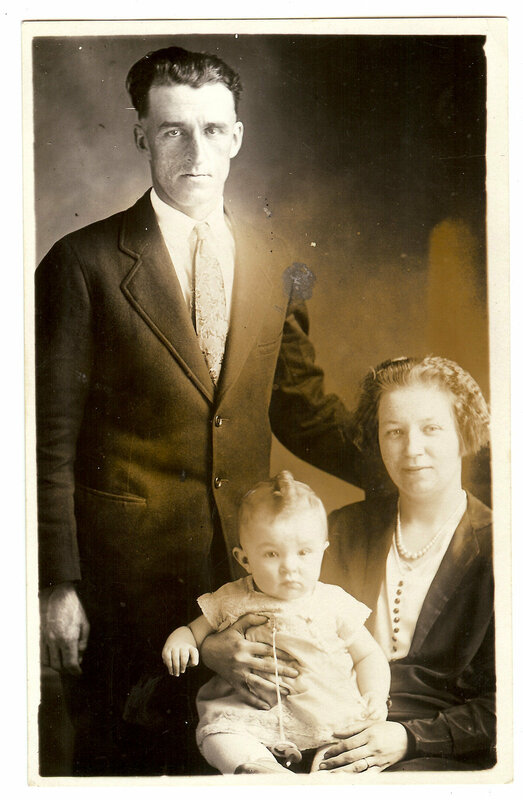 Viva Seymour married George H. Roop on June 8 juin, 1918, in Mason, in Ingham County, in Michigan. Next time, more on the Seymours. This is the article I wrote on my blog Nos Ancêtres. It’s written in French. If you can read French then you know that some descendants whose name is Seymour are in fact descendants of Guillaume Couture. This story in itself is quite amazing. When you start digging for your roots you come across others’ ancestors. This is just one more case. I will translate this article next time for someone who contacted me last month. Guillaume Couture est l’ancêtre de John Seymour, alias Jean-Baptiste Couture, celui qui a marié Sophie Gauthier, la soeur de Rose Gauthier, alias Larosae Gotié. Au baptême de Sophie Couture (fille de Jean-Baptiste Couture et de Sophie Gauthier) le 13 février 1850, Coteau-du-Lac (St-Ignace ), l’enfant est âgé de 4 semaines. Et il est mentionné que le père est journalier de la rivière à la Truite. Ce serait au Nouveau-Brunswick…, mais y a-t-il un autre endroit qui porterait ce nom? Souvent quand quelqu’un se trouve à un endroit, il y a aussi d’autres membres de cette famille…. Il existe une rivière à la Truite près de Huntingdon, la ville du maire Stéphane Gendron. C’est sûrement là que travaillait Jean-Baptiste Couture en 1850 quand sa petite Sophie est née. Jean-Baptiste Couture s’est exilé aux États-Unis comme 900000 autres Canadiens-français. 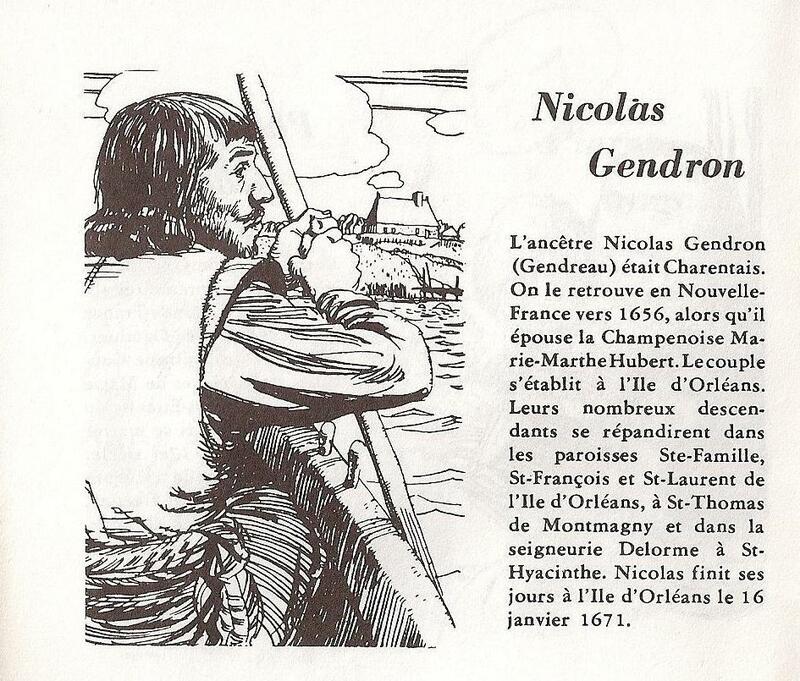 On retrouve donc plusieurs descendants de Guillaume Couture au Michigan qui l’ignorent. Entre autres, les descendants du fils de Jean-Baptiste, Albert D. Seymour. 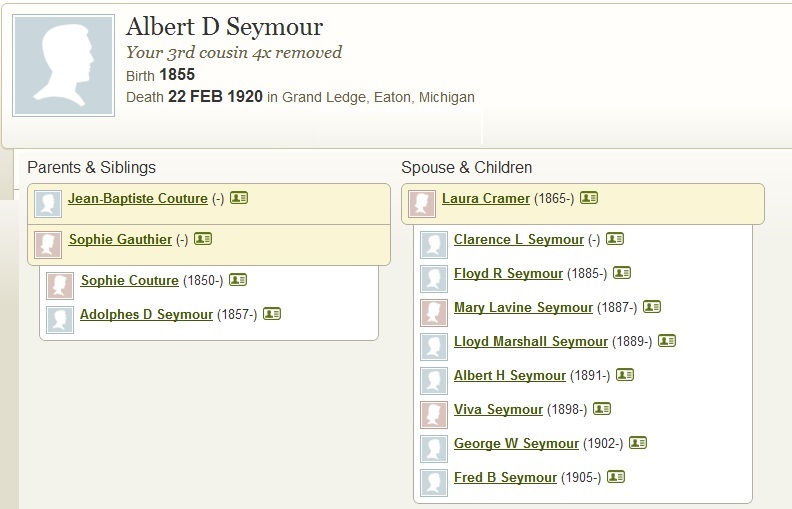 Albert D. Seymour est né vers 1855 et est décédé le 22 février 1920 à Grand Ledge, dans le comté d’Eaton au Michigan. 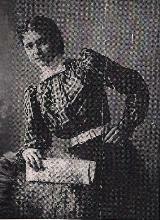 Il avait marié Laura Cramer le 3 juillet 1883 à Mt Pleasant, dans le comté d’Isabella au Michigan. Laura s’est remariée le 11 juillet 1920 avec George P. Bartlett. Le couple Couture-Cramer eurent au moins huit enfants. 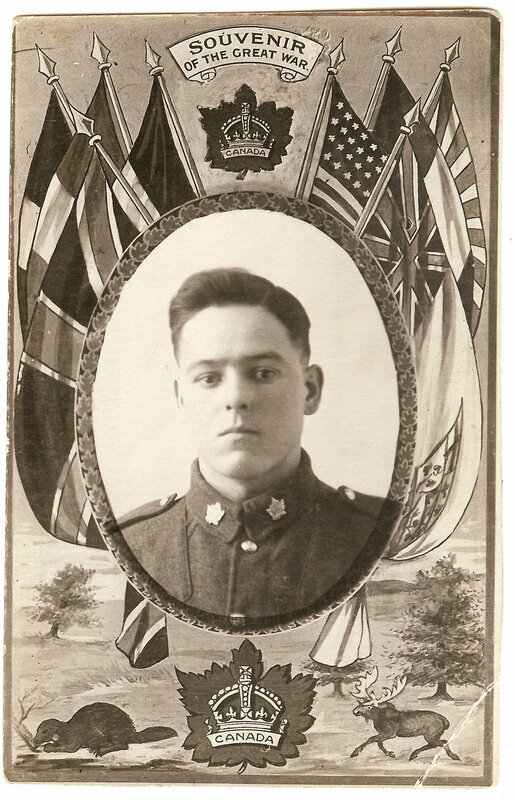 Viva s’est mariée avec George H. Roop le 8 juin 1918 à Mason dans le comté d’Ingham au Michigan. Hormidas Binette was Saül’s brother. Hormidas is the little boy on the right in this old picture my aunt Evelyne had in her plastic grocery bags back in 2007. Five years later, while searching for more information, I found this Website that had some pictures of Hormidas. I just typed in Binette and the floodgates opened. We had pictures of Hormidas and a whole lot of information about him. Hormidas survived the war and had descendants to remember him. Saül Binette is not famous. He is just a father with his little daughter Cécile and his wife Rosa Beauparlant. This is Saül Binette again with his wife Rosa Beauparlant. Here Saül is seen with his brother Hormisdas. Hormisdas is on the right in the first row. That’s what I like about Saül. I like to talk about ordinary people on this blog. Some people search for ancestors who are famous. They go on the Internet and type their names. The man is Honoré Sauvé with his wife Julie Leroux. 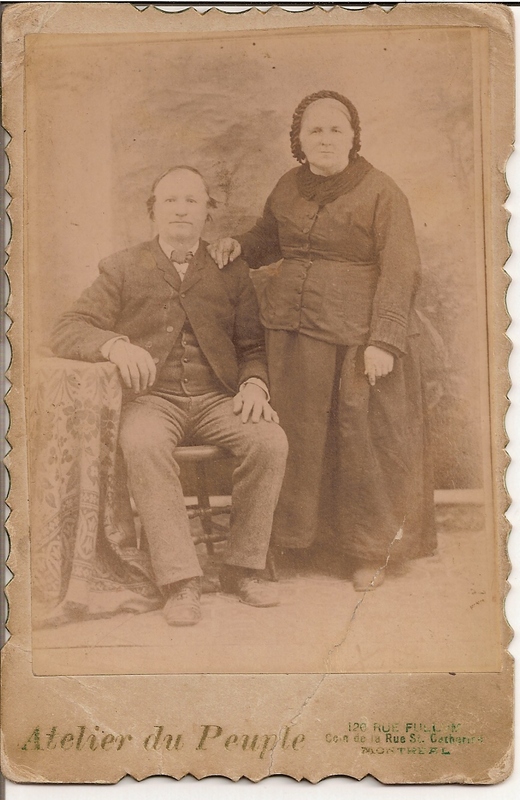 They are my maternal great-great-grandparents. Not famous people. They are also Saül Binette’s grandparents and now newly found Brenda’s great-great-grandparents. Thank you for sharing! I’m a granddaughter of Saül Binette and I was wondering about my family since I don’t have access to the family book anymore (lost it during the parents separation). Again, thank you for sharing! I don’t believe Brenda has a copy. This picture, probably taken in the late 1890s, was part of a bunch of old pictures in two plastic grocery bags that my aunt Evelyne had stashed away in her closet. I just had to share that bunch of old pictures with everyone. Share I did since 2009. This article is No. 285! Now, go on Google and just type Saül Binette. Of course some links are just there to get some traffic. I don’t care much about getting traffic on my blog. I just enjoy genealogy, writing about it and sharing what I found. If you write a comment on this blog, I will write an article about it so everyone will be able to read it. If you share something, then I will share it with my readers. You see I like to write and I like to share. When you like to do something you don’t ask for anything in return. Just pure selfish pleasure like George Stewart told me when I visited him last September. Who’s George? That’s a long long story. Curious? Then click here for just a glimpse, but be sure to read the comments at the end. So what about Saül Binette, the little boy on the left in this picture of the Binette Family? That’s what’s this blog is all about. I like searching and I like old pictures. So why should I ask for money when I have got everything I want. So what about little Saül on the left? I know very little about Saül, but now I know he was Brenda’s grandfather. I know very little about Brenda and she does not know that much about me. She will sure find out when I invite her to my Ancestry family tree. She just has to ask.